The combined engine capacity of the new cars we build in just one year is more than the entire electricity generation capacity in the world. If we power our cars with fuel cells, we can use them as clean power plants the 96% of the time we are not driving in them, generating all the electricity we need, at competitive costs, with zero emissions. Frank Wouters, Director of the EU-GCC Clean Energy Network, and Ad van Wijk, Professor Future Energy Systems at Delft University of Technology, show how this could be done in the United Arab Emirates (UAE). We are not using our cars very much in the UAE, nor elsewhere by the way. A quick scan on Dubizzle, the leading internet platform for used cars in the UAE, shows that we drive some 20,000 km per year. At an average speed of 60km/h, this means that we use our car less than 1 hour per day. The remaining 23 hours, or 96% of the time, our cars sit idle. In another context we would call that stranded assets. Let’s assume that an average vehicle has an engine capacity of 100kW. More than 80 million cars are sold each year, which represents a capacity of 8,000GW. The combined capacity of all power plants in the world producing electricity amounts to 5,000GW, so each year we are adding more capacity in our car engines than we have installed to produce electricity. 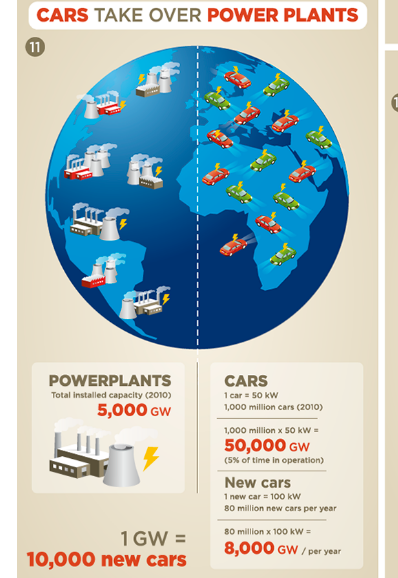 And we only use those cars 4% of the time, whilst power plants are used thousands of hours per year. Of course a car engine, as we have them now, doesn’t produce electricity, it only moves the car; but let’s look at fuel cell cars. A fuel cell is a device that produces electricity from hydrogen, with pure water coming out of the exhaust. If we put a fuel cell in a car, the electricity is used to power electric motors that move the car, just like other electric vehicles. The difference is that pure electric vehicles, or EVs, require batteries, which add weight to the car and require a long time to charge. A fuel cell car can drive 100km on one kg of hydrogen and tanks that take 7kg of hydrogen can be refilled in 3 minutes. Several manufacturers are now offering hydrogen fuel cell vehicles, or HFCVs, among which are Toyota, Hyundai, Honda, Ford and General Motors. At Delft University of Technology in the Netherlands, the team of Dr. Ad van Wijk, Professor Future Energy Systems, has developed a conceptaround fuel cell vehicles, that are not only used as cars, but could ultimately replace our power plants. The idea is to use the fuel cell in the car to produce electricity also when it is not driving, which is 96% of the time. To make that possible, the car would need to be hooked up to a supply of hydrogen when it is parked and it needs to be connected to the electricity grid, either at home, at work or in a parking garage. The exhaust water can also be used as drinking water and in colder climates the waste heat could be used for heating. With an annual addition of 8,000GW of car engine capacity, it would take less than a year to replace the entire existing stock of power plants in the world. It is possible to turn our stranded assets into the energy supply of the future, especially if we can find a cost-effective and clean way to produce the hydrogen. This article describes such a system for the United Arab Emirates, where the entire value chain is clean, i.e. without using fossil fuels. The term hydrogen economy, first coined by John Bockris at General Motors in 1970, describes an energy system that uses hydrogen as the primary energy carrier. 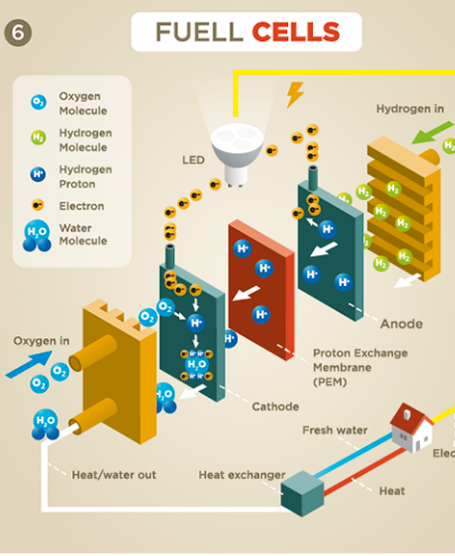 Hydrogen can be produced from water, using clean energy, and when hydrogen is converted into useful energy such as electricity or motion, it only produces water as a by-product. Due to the lack of carbon or nitrogen, no other harmful exhaust gases are produced, hence burning hydrogen does not contribute to climate change. It should be noted that it is also possible to produce hydrogen from natural gas, or use electricity from fossil fuels to produce hydrogen, so hydrogen is not always “clean”. In fact, 95% of hydrogen is produced from methane today. We modeled such a clean hydrogen system on the UAE, which is a major exporter of oil and gas, but has a strong forward looking vision on energy. The system described here is completely clean, feasible and cost effective and opens an avenue for the UAE or other GCC countries to remain global energy players in the new low-carbon energy paradigm. The main reason being the availability of low-cost solar energy in the region. The United Arab Emirates, with oil production of more than 3 million barrels per day, is in the top five for global oil export. The Emirate of Abu Dhabi has the vast majority of the country’s oil and gas reserves, and is considered a low-cost producer. More recently, the UAE has also led the global race towards ever lower costs for solar power, with a recent bid for ADWEA’s Sweihan solar PV plant coming in sub 3 $ct/kWh, following DEWA’s previous world record low price of 2.99 $ct/kWh for a solar PV plant. In the near future solar electricity will cost around 2 $ct/kWh. So the UAE is blessed with low-cost fossil fuels, which has helped build the nation, but the country is equally blessed with low-cost solar energy, which can help sustain its global energy leadership position in a low-carbon future. For that to happen, the hydrogen route could be very interesting. Let us focus on the cars first. The UAE has among the highest car ownership rates in the world. In Dubai there are more than 540 cars per 1000 inhabitants, so there are an estimated 5 million cars in the country. With each car driving 20,000km per year, this adds up to 100 billion km in total. If all cars were fuel cell cars, and knowing that a fuel cell car can drive 100km on 1 kg of hydrogen, we need 1 billion kg of hydrogen per year. We want to produce the hydrogen using locally available solar energy, which is the cheapest in the world and which is cheaper than conventional energy. Hydrogen can be made from water using electricity in an electrolyser; present day electrolysers require 50kWh/kg H2, including the electricity required to demineralize sea water and compress the hydrogen. So we need 50,000 GWh of electricity to produce 1 billion kg of hydrogen. With the high number of sunshine hours in the UAE, we would need 23.5GW of solar PV to produce enough H2 for all cars. With an average capacity of 100kW per car, we would have 500GW of fuel cell capacity available to drive, but also to generate electricity for the grid. Remember that most of the times our cars are not used. Given that we have a little more than 27GW of grid connected capacity in the country, this would be more than enough to replace conventional power plants. The UAE electricity consumption in 2014 was 100TWh. Using the fuel cells in the cars when they are not driving and assuming a consumption of 0.05kg H2/kWh, this would require an additional 5 billion kg of H2, on top of the 1 billion kg H2 required to drive the cars. Using the same formula, this requires an additional 117.5 GW of solar PV capacity for the electrolysers producing the hydrogen. Do we have enough space for that? Per hectare of land, approximately 2.5MW of modern solar PV systems can be accommodated, depending on the efficiency of the solar cells. To cater for the car transportation and electricity production we need 23.5GW plus 117.5GW, which is 141GW. At 2.5MW per hectare, this represents roughly 350,000 hectare or 3,500km2, which is slightly more than the farming area in Abu Dhabi, which presently occupies 200,000 hectares. The surface area of the UAE is 83,600km2, the majority of which is desert, so we only need 4% of the surface area of the country covered in solar panels to produce enough hydrogen for transportation and electricity production. Fuel cells not only produce electricity but also water. Every kg of H2 that is converted to electricity produces 9kg of water. Since we will convert 6 billion kg of H2 each year, we will produce 54 million m3 of drinking water. Each person in the UAE consumes 550 liters water per day, and 56% of that is for residential use. With a population of 9.5 million, the residential water consumption amounts to approximately 1,000 million m3 per year. So apart from transport and electricity, the fuel cells also produce 5% of the drinking water. So all of this is technically feasible with present day technology and sounds promising, but what about the cost? Although hydrogen fuel cell cars are still more expensive than standard cars, there is no reason why they should be more expensive in the future, if we manufacture them at similar scale. So the main difference lies in the cost for the fuel. It requires 50kWh to produce 1 kg of hydrogen and since solar energy costs 2ct/kWh in the UAE, the energy cost to produce hydrogen is 1$/kg. An electrolyser costs approximately $600 per kW nowadays. If we implement large scale projects such as proposed here, it is safe to assume an electrolyser of 1MW will cost $400,000 in a few years from now. The UAE has more than 2000 annual sun-hours, hence such an electrolyser coupled to a solar PV system would produce 40,000 kg of H2. Assuming a ten-year life and linear depreciation, this would add 1$ to the cost of the hydrogen. The overall cost of hydrogen in such a scheme in the UAE would hence amount to 2$/kg. Given the spectacular decline in the cost of solar PV electricity in just a few years, and given that fuel cells, electrolysers and related equipment are not deployed on a mass scale yet, it is safe to assume that this cost estimation is conservative and that the cost will be (much) lower over time. One should always bear in mind that the cost dynamics of hydrogen made like this, since it is made from plentiful sunshine and water, is only related to the cost of the technology, which has a fundamentally different dynamic than e.g. fossil fuels. A fuel cell car can drive 100km on 1 kg of hydrogen. At 2$/kg for the hydrogen, the fuel costs are 2ct/km. The present cost for unsubsidized petrol in the UAE is 1.81 AED or 50ct per liter. A modern and fuel efficient car that drives 17km per liter therefore has fuel cost of 3ct/km, so a fuel cell car that drives on hydrogen made by solar energy in the UAE is 50% cheaper per km than a conventional car. The interesting part is yet to come. Since we are not using our car much, we can use the fuel cell to produce electricity for the grid when we are not using the car. Per kWh, approximately 50g of H2 is required, which amounts to 10ct/kWh. Since we already have the fuel cells, no or little additional capital costs are required. The present cost of generation in the UAE is approximately 5-7ct/kWh, depending on the Emirate, mainly due to the low cost of natural gas in the UAE. However, there is shortage of natural gas and future supply will increasingly come from LNG, which is more expensive. The electricity from the nuclear power plants that are currently being constructed in Abu Dhabi will also increase the cost, which are only partly offset by the lower cost of solar energy. It should be noted that, although solar power is the cheapest form of power in the region, increasing shares of solar will introduce additional costs for storage or spinning reserves since the sun doesn’t always shine. Having our fuel cell cars fill the gap and eventually replace gas-fired power plants would be a great proposition. Since solar PV is the cheapest form of electricity but not dispatchable, it makes sense to work towards a combination of solar PV and electricity from the fuel cells. The maximum share of solar PV in the UAE electricity system without major additional balancing or storage costs is about one third. If we complement that with electricity from the fuel cells, we have mixed electricity costs of 7 ct/kWh, which is in line with the present mix in Dubai. On average, each car would only need to be used approximately 20 minutes every day to produce electricity in this scheme. The hydrogen case can hence compete with the present and planned set-up, which is a combination of gas, nuclear and solar energy, and will improve in the future. If we convert our cars to fuel cell cars, we clean up the air in the cities, replace conventional power plants by using what we already have a little more, and produce pure drinking water as a by-product. How cool is that? We have described a system, where hydrogen is produced from seawater and low-cost solar energy in the UAE, at a cost of $2/kg. With increasing efficiencies of the technologies involved, as well as scale effects, these costs could well be reduced by another 30-50% in the next decade or so. Half of those costs are the cost for (solar) energy, which is among the lowest in the world. Given the availability of ample land in the UAE, the potential to make hydrogen for the world market is massive and hydrogen made in the UAE could well compete on the global market for clean energy. If we would dedicate 20% of the UAE land area for the hydrogen economy, we could have 665GW of solar PV capacity to produce hydrogen. This solar capacity would produce 28 billion kg of H2, representing value of $56 billion per year. The UAE now produces a little more than 1 billion barrels of oil every year, which, at $50 per barrel, represents revenue of $55 billion. Such a scheme would of course require massive investments in infrastructure and would require several decades. The infrastructure would include the solar power plants, the water desalination stations, electrolysers, gas processing equipment, compressor stations and of course hydrogen storage and distribution infrastructure. At the work place, cars could park in a car park building with a supply of hydrogen, and a hook-up to the power grid and water network, plus equipment to measure the hydrogen consumed and electricity and water produced, so the car owner can get paid for the use of the fuel cell in the car. In the near future, cars will be able to drive autonomously, so at night the cars can drive to such a car park nearby to earn some money while the owners are asleep. The UAE has more than 50 years of experience with commercial oil and gas operations, and the hydrogen economy can greatly benefit from this intellectual and physical infrastructure. Over time, the nation can construct the building blocks for the hydrogen economy, slowly replacing the fossil fuel infrastructure, including export terminals for hydrogen, to continue supplying the world with energy. The difference is that water and sunshine will always be available. Frank Wouters (frank@frank-wouters.com) is Director of the EU GCC Clean Energy Network, which fosters clean energy partnerships between the EU and the countries of the Gulf Cooperation Council. He is former Deputy Director-General at IRENA (International Renewable Energy Agency) and former Director of Masdar Clean Energy. Ad van Wijk (a.j.m.vanwijk@tudelft.nl) is Professor Future Energy Systems at the Delft University of Technology in the Netherlands. He is the author of many books and articles, including Our Car as Power Plant, which can be downloaded for free here.